This is a sermon for the fourth Sunday in Lent, given in the “church next door.” The Scripture it references is John 9:1-41. Over these Sundays in Lent, as Bruce pointed out to us last week, we have a series of readings which describe different people’s encounters with Jesus; each encounter giving the people involved – and through them, us – a deeper insight into who Jesus is. But this morning I want to look at the process of arriving at that deeper insight. I mean, we often call this morning’s gospel reading, the story of the “man born blind,” but until somewhere towards the end of the story he’s a fairly passive figure. In contrast, the whole encounter is kicked off, if you like, by a question from Jesus’ disciples, and the unfolding drama is an outward spiralling of layers of response to their question. So is this the story of the man born blind, or part of a bigger story of the disciples and their developing discipleship? Think how often through the gospels Jesus’ teaching or explanation is prompted by questions from the disciples. This isn’t just because they’re dim and not getting what’s right in front of their noses; it can also be because they are doing what good disciples do, and questioning their teacher about their experience to learn as much from it as possible. Think for a moment of the Jews in this reading who claim to be disciples of Moses. By this they meant something much stronger than simply that they obeyed Moses or kept the Law. I once had the chance to hear a Rabbi speak about the Jewish approach to Scripture. He explained that even very ancient Jewish scholarship on Scripture is constructed as a series of questions which the scholar brings to the text and to which the scholar attempts to find answers. And not necessarily the sorts of questions we might be used to as scholarly, about author, date of composition, social setting, and so forth, but questions about emotions and motivations and matters of the heart, questions about how this text hits our own living concerns. So for example, this morning’s Old Testament reading began with the Lord asking Samuel, “How long will you grieve over Saul?” and the Rabbinic commentaries on this might well spend pages and pages exploring the questions of why Samuel was grieving, what Saul’s kingship had meant to him, and how this might relate to our life of faith now. So the disciples of Moses, immersed as they were in this kind of questioning, open-ended – even, we might say, creative and imaginative – study of Moses, are willing to open Moses up to questioning in great depth. That’s what it meant to be a disciple, and that lies behind the mentions of discipleship in this morning’s gospel. On the other hand, there are questions which are not really questions at all. ‘You were born entirely in sins, and are you trying to teach us?’ ‘Surely we are not blind, are we?’ Not so much questions as expressions of closed-mindedness. There is here an absolute refusal to recognise that this situation might have anything to teach them. In this encounter, the questions which come from openness, which allow for the possibility of real learning and growth, are those of disciples or those exploring the idea, maybe on the way to discipleship. This suggests that a mind open to unexpected insight, and indeed actively seeking understanding, is a fundamental trait of discipleship. To this questing mindset – and this was reinforced for me by what I heard from the Rabbi about how Jews approach Scripture – study and learning are not ends in themselves, but a form of worship. To question, to wonder, puts us in a stance of fundamental openness to and humility before the God who is greater than any human understanding. To worship in this way is to become the fertile ground in which God can grow much that is good for the healing of the nations. It is when we question that we bring our problems, our struggles, our hurts, to Scripture, to tradition, and to God Himself, forging points of connection. Without our daring to question, our difficulties and the resources which might speak to them stand separate, static, without any point of contact. But when we question we throw a bridge across that chasm and claim all the riches of God for our very present trouble. Discipleship starts where we are, just as it did for the man born blind. The first step on the path is always at your feet. But it is in being open to questions and new insights that we are able to move along that path. When I was working in North Melbourne, I had a particular parishioner I visited several times in hospital. And she reflected with me, in the face of uncertainty about what her future held; that in her words, “the opposite of faith is not doubt, but certainty.” If we are certain of something we are closed to any possibility of something new breaking in. The Pharisees in this reading had a very great deal of certainty; about God, about wisdom, about sin. But in the end they were blind because their certainty closed their eyes to anything new. So where does that leave us? 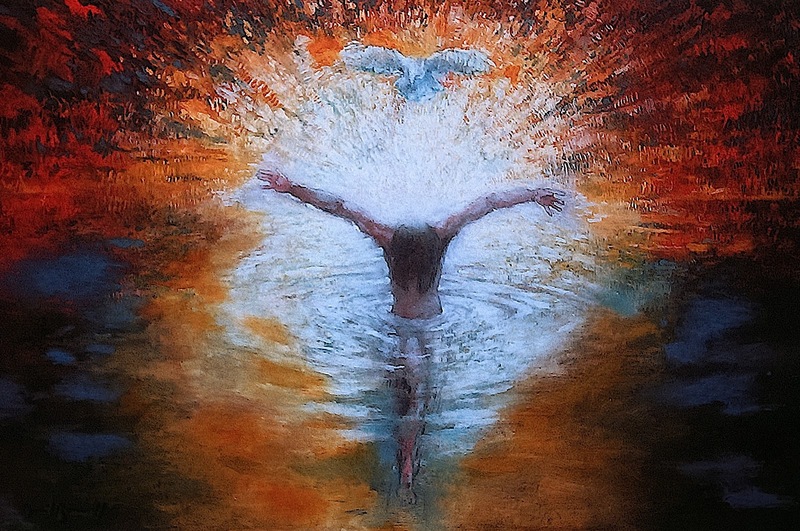 As disciples of Christ, each of whom has promised in baptism to love God with our whole mind, I’d suggest that this reading calls each of us to fresh encounters with Jesus. It shows us that we should not be satisfied with what we already have, but take the initiative in seeking more and deeper wisdom, to bring the deepest longings of our hearts and minds, to bring all of the circumstances of our own lives, into questioning dialogue with Christ, in whatever form we each find effective. This is how we will grow and become all that God has created us to be; so let’s not neglect the opportunity. This reflection was given during the daily Eucharist in the chapel of an Anglican convent. The Scripture it references is Matthew 5:20-26. It’s a difficult teaching, this one, and I suspect honoured much more in the breach than in the observance. If all Christian people really did seek to be reconciled with their brothers and sisters before coming to the altar, our parishes would be much healthier places. But it struck me, as I was considering this, that we tend to read it very much on an individual level. I must be reconciled before I come before God. But we never come to God’s altar just as an individual; we gather here always in community. We must be reconciled to one another before we come to God. It struck me that there’s something about who we are when we gather here that is more than the sum of its parts. We don’t just each of us offer our individual selves, but we offer our community, with its relational qualities and its synergies, as a living sacrifice. No wonder reconciliation is so important; we wouldn’t want to offer to God a fractured, disordered or agitated body. Now of course, I wouldn’t dare comment on whether that’s ever true here. I’m a guest in your life and you’re best placed to reflect on that yourselves. But I’d encourage you to consider that the quality of our relationships is part of what we bring with us, when we come before God, and to consider whether they need any attention in your own life. I wrote this prayer today for a friend of mine who has a child with special needs; but I wanted to share it, because if there’s one thing struggling parents need to know, it’s that we’re not alone! in fasting and sincere reflection. and in the turmoil of meltdowns. think this is not how it should be. But Lord, this is my life. this is where my hands are full. This is a sermon for the first Sunday in Lent, given in the ” church up the road” and the “church next door.” The Scripture it references is Psalm 32. I want to think a little bit this morning about prayer. Lent’s a time when we traditionally focus on prayer; and as I said on Wednesday night, that’s a key part of the Christian life because it’s our connection to the love of God, how that love is made real and effective in our lives. But it’s something many of us struggle with; we get all sorts of ideas in our heads about prayer, what is the “right” way to pray, what kind of prayer will actually get an answer, and so on. And I think today’s psalm is, in its way, trying to deal with one of the commonest problem ideas about prayer, so I want to see what it can say to us about that. If we look at verse ten, we see that it says, “Many are the torments of the wicked, but steadfast love surrounds those who trust in the Lord.” At first blush this seems to present us with a problem, because it could be read as if it were suggesting that people suffer because they are wicked. And then that leads us down a nasty rabbit hole of thinking that when we suffer, it must be because we did something wrong, maybe even that we’re being punished, and that all just pushes us further away from God… you can see why it’s a problem! But I think that actually that’s not the point that the author was making at all. I think he was trying to say something very different; I think he was trying to say that God hears our prayer. Looked at from that point of view, the wicked suffer torments not because they are bad, or because they are being punished, but because they do not pray; they have cut themselves off from relationship with God, and whatever good might flow to them from that. (And that good might not be change in their external circumstances, but change in their own response to those circumstances!) On the other hand, those who trust in the Lord, says the psalm, are surrounded by steadfast love; not because they have earned or deserve it, but because they ground themselves in relationship with God, and receive the benefits which flow from that. God hears our prayer; God responds to our prayer; praying makes a difference. And I think we need to be reminded of that. Sometimes it’s difficult to believe that God listens to us, especially when we’re going through a rough time. But the psalmist is trying to remind us that when we pray, God breaks through the chaos of our lives to set us firmly on the ground. When we pray, God reaches across the gulf of our broken relationship with God to mend that break, to put our hearts and lives and communities back together. But part of the reason I think some people struggle with this matter of prayer, is that actually, not all of us naturally pray in the same way. For some of us, the stereotypical idea of prayer as sitting down, eyes closed, and silently speaking to God in our minds leaves us feeling dry and empty. So part of what I’d encourage you to think about, this Lent, is whether your prayer life is actually working for you. And if it isn’t, don’t be afraid to experiment or try something new. Walk the labyrinth. See what happens if you sit down to draw while you pray. Sit with one of the questions Jesus asked his disciples, and see what your own answer is. Gaze at an icon. Come to Taizé this evening. The possibilities are endless, and if you’re not sure where to start, maybe ask to borrow a book or two on different ways to pray – I’ve built quite a collection over time – and see whether any of those ideas grab you. One is your spiritual life now; your connection with God, your ability to know God’s steadfast love, and to respond with a love of your own. But the other reason is that our spirituality changes over time. What works for you at one point in your life may become dry and empty at another time; often when we’re grieving or depressed or anxious or otherwise going through a rough time, the things which sustained us when life was going well, give us no comfort or peace, and we can be left feeling abandoned or wondering just where God is in all of this. But if, during the better times, we’ve given ourselves permission to experiment a bit – tried some things which are a bit different, even pushed the edges of our comfort zones – then when the old familiar patterns of prayer are leaving us unsatisfied, we have a bit of a tool kit, as it were, of different things which might help us reconnect in a new way. I know that when Zoë was diagnosed with autism, I went through a period of real grief and I struggled with what that meant, for me, and for us as a family, but also with what it might mean for her relationship with God. How would I teach a child with a severe speech delay how to pray? At that time I found a book called “Praying in Color,” which was all about drawing while praying and letting what was on the page be our communication with God. Not only was it useful for me in thinking about how my creative little girl might find her own way to relate to God, but I found it enormously helpful for myself to experiment; and since then I’ve been exploring and playing with drawing as a regular part of my prayer life, something I’ve found very enriching. Really my point is this; prayer matters. It makes a difference. And so I encourage you, today and this Lent in particular, to take prayer seriously; to think about how to pray, not just doing more of the same old thing, but how you might enrich your relationship with God. So that the steadfast love and mercy of God might surround us in our life together. This is a sermon for Ash Wednesday, given in the “church next door.” The Scripture it references is Psalm 51:2. Here we are at the start of Lent. A time to seek God’s mercy; a time when we set aside our noise and bustle to hear the still small voice of the Spirit; a time, not to put too fine a point on it, when we pay attention to the reality of sin, and invite God to do something about it. And I wonder whether the imagery is really all that helpful to us. Because the way the psalmist puts it, it sounds as if sin is a substance, a dirt which clings to us and can be washed away, leaving us bright and clean. But I’m not so sure that’s right. Here’s what I mean. I don’t think sin is so much a thing in its own right, as an absence of something; an absence of love. St. Paul described sin as “lawlessness;” and we know that the law can be summed up in two commands; love the Lord your God with all your heart, mind, soul and strength; and love your neighbour as yourself. Julian of Norwich, in her visions, was assured of much the same thing; sin is not a “thing,” a substance, but a quality we experience when grace is not yet complete. What’s the difference? Instead of being washed thoroughly, so that all evil might be removed, I imagine being washed through with God’s grace; with the Holy Spirit pouring God’s love into my heart until it overflows through every part of my being, leaving none of me untouched or still darkened. Ebbing into all wounds and brokennesses of my humanity and healing them; flooding into all my pride and humbling it; pouring into my unrealised potential and enlivening it. It’s why, next to this verse in the “thoughtful spot,”* for Lent, I have a picture of Jesus’ baptism; a man immersed in water, and the Spirit hovering over him in light; it seemed to me to capture so very well what it might mean to be washed throughly, and points us back to our own baptism as the place where this process of being loved into wholeness begins. But of course the process continues from there: and this Lent we have a time to focus on it. So here is the challenge of Lent, as it presents itself to me this year: what can I do in that process? How can I put myself in the best possible situation to be washed through by God’s love? And this is where the traditional disciplines of Lent might be useful; whether it’s time for prayer or meditation, whether it’s fasting, whether it’s seeking the help and wise counsel of others, or indeed coming to confession; all of those things are tools available to you, and I encourage you to consider how best you might use them. And there are several study group options too; and if you haven’t looked at the leaflet setting them out, I do recommend having a look and seeing whether any of them might speak to where you’re at. But none of these things are the point; they are means to an end, and that end is to know God’s love for us more fully, and to respond to God in love, more fully. And to be so filled with those loves that the no-thing, the lovelessness, of sin has no space left to claim in us. As you came in this evening, I had some music playing, which was a song written by Hildegard of Bingen, the 11th century abbess. In it, she recalls how at the beginning of time all creatures grew and blossomed before their creator; but now, she says, she and her “little ones” – by which I gather she means the nuns under her care – are tired and failing; a mockery of what they were supposed to be. But, she says, she knows that the work of God is not complete until our bodies are in fullness of health and arrayed in jewels; so she brings her wounds to the father so that he may stretch out his hand to them, and she implores all of us to do likewise. It’s a complex poem and my summary doesn’t really do it justice, but that image of bringing our wounds, our vulnerabilities, to the outstretched hand of our loving father, to be restored to health and garbed in dignity, is one worth holding onto; and I encourage you to enter into Lent in that spirit. *The “thoughtful spot” is a shelf in the narthex of the church, which houses a rotating display of quotes, pictures, and other prompts to reflection.